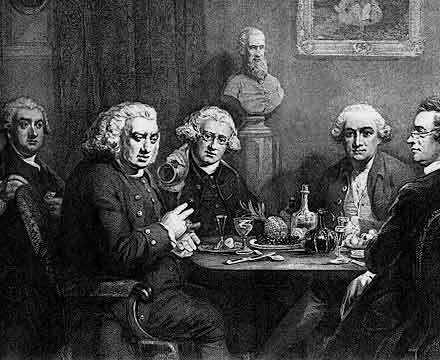 A few months ago I posted Samuel Johnson's essay on sleep. Since then I've been to his house, which is a fascinating little museum in the back alley's of the City of London, and I've read a little bit more about him and his friends. The man is fascinating and well worth discovering (here's his Wiki which has some good links). His dictionary alone would qualify him for props, but even without that, his essays for The Idler, The Rambler and the Gentleman's Magazine, his literary criticism, his personal life (pride, physical tics, beautiful but ultimately tragic love with his wife, moral outrage at most things, disputes with bailiffs - and milkmen, towering intellect, abolitionist activities and so on) make him one of my favourite characters and a definite shoe-in for the old "who would you have for dinner" question. I'm no expert and really can't do him justice. Talking about him at length is like trying to explain climate change without research - you just come across as a twit who doesn't know that much. That said, it's interesting to note that 250 years ago he was writing more cohesively and with more originality about human nature and our kind's foibles than pretty much any modern journo you care to mention. A lot of the knee-jerk moralising and navel-gazing you see in todays newspaper columns and magazines just comes across as pale imitation. The cure for the greatest part of human miseries is not radical, but palliative. Ease, a neutral state between pain and pleasure...if it is not rising into pleasure will be falling towards pain. Almost every man has some real or imaginary connection with a celebrated character. All censure of a man's self is oblique praise. It is in order to show how much he can spare. It has all the invidiousness of self-praise, and all the reproach of falsehood. Such is our desire of abstraction from ourselves, that very few are satisfied with the quantity of stupefaction which the needs of the body force upon the mind. Alexander himself added intemperance to sleep, and solaced with the fumes of wine the sovereignty of the world. And almost every man has some art, by which he steals his thought away from his present state. I would injure no man, and should provoke no resentment. I would relieve every distress, and should enjoy the benedictions of gratitude. I would choose my friends among the wise and my wife among the virtuous, and therefore should be in no danger from treachery or unkindness. My children should by my care be learned and pious, and would repay to my age what their childhood had received. "In 1764 Johnson visited his friend Bennet Langton at the Langton home in Lincolnshire. Johnson and the Langtons walked to the top of a steep hill, and Johnson decided that he would like to roll down it. He said that he had not had a roll for a long time. Emptying his pockets, he lay down and rolled all the way to the bottom."